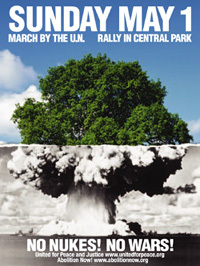 NEW YORK- A coalition of anti-war and anti-nuclear groups has planned a march and rally in Central Park for May 1, the day before the start of the Nuclear Non-Proliferation Treaty review conference at the United Nations. United for Peace and Justice, which opposes war, and Abolition Now!, which advocates nuclear disarmament, were among the groups planning the demonstration. Organizers reached an agreement with police and parks officials for a march beginning at 50th Street and First Avenue in Manhattan, heading west at Dag Hammarskjold Plaza, snaking through midtown and ending with a rally at Heckscher Ballfields in Central Park, United for Peace and Justice spokesman Bill Dobbs said Thursday. Protesters had wanted to gather on the park's Great Lawn, but the parks department agreed to allow the rally at the ballfields instead. The Department of Parks & Recreation said no to the Great Lawn because the grass is vulnerable during the early season, Commissioner Adrian Benepe said. The ballfields are scheduled to be reconstructed in the fall, he said. Several hundred people from Japan are expected to attend the event, said Jackie Cabasso, the U.S. coordinator for Abolition Now! Among those expected to speak at the rally are the mayors of Hiroshima and Nagasaki and survivors of the 1945 bombs, she said. Police estimated 125,000 people attended an Aug. 29 protest timed to coincide with the Republican National Convention; United for Peace and Justice said more than 500,000 were there. While planning that protest, United for Peace and Justice unsuccessfully sued in an attempt to force the city to allow a rally on the Great Lawn. Though some people gathered in the park, no major demonstrations took place there.